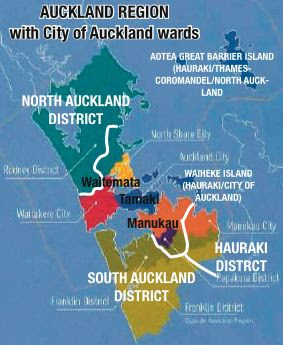 On the last issue of the Northern boundary - the suburban districts of Whangaparoa and Orewa should become part of the city. That is what the Royal Commission recommended as well. As you can see from my map in the submission to the commission (and then later to the select committee) the catchment of the Waitemata ought to rest with Auckland and the Kaipara catchment with whatever is North of the city. The assets currently held by the ARC in that Northern area can be retained as a legacy. Mike Lee was putting up a good fight over making the über city as greater as possible, but Wellsford is not really part of anything that could be described as "Auckland City". The city should be focussed on the urban area, not left to govern huge swathes of rural land as Lee advocates. I've seen arguments presented that the area left out of the city will be carved up by developers - but I'm unconvinced. It may be more likely that a Council of urbanites would sacrifice the rural areas for their agenda (be it conservation and locking it all up, or the other extreme of wholesale suburbanisation and subdivision) without the locals having any say in the matter. To me that is a more dangerous proposition. The large rural areas on either side of the city should run their own affairs and determine their own destiny rather than have Queen Street and Town Hall dictate their future. If they want to merge with the next rural council, or go it alone, so be it. collecting up all the second-hand electric locomotives that can be found around the country, giving them a lick of paint and an oil change, and pressing them into service dragging Auckland's existing fleet of tarted-up old carriages. Apparently a stockpile of retired electric locomotives in Palmerston North is being eyed up. As well, some main trunk freight locomotives will become surplus to requirements, once the recently ordered fleet of 20 new freight locomotives arrives from China. GOVERNANCE IS IRRELEVANT, BUT I AM OPPOSED TO THE SUPERCITY IN ITS ENTIRETY, REGARDLESS OF MAORI REPRESENTATION.NO WONDER MIKE LEE IS PARANOID.FIRST HE OBJECTED TO THE WATERFRONT STADIUM SAVING THE PORTS.THEN HE GETS LOCKED OUT OF QUEENS WHARF WITH BANKSY.THEY SLAMMED THE GATE SHUT IN HIS FACE AND PADLOCKED THE IRON RED FENCE.NOW WELLINGTON ARE EXTRACTING THEIR REVENGE FOR THAT SNUB AND COMMON SENSE TO TREVOR MALLARD I BELIEVE IT WAS.WHERE IS STEVEN JOYCE FROM ANYWAY? For example, Bledisloe wharf must and will remain a crucial part of port operations - regardless of any future rationalisation within the port sector. Auckland's historic Queens Wharf will be reclaimed for public use next April and the two 100-year-old cargo sheds could be restored for a cruise ship terminal and "party central" for the 2011 Rugby World Cup. IT MUST BE FENCED OFF SO DRUNKS DON'T FALL IN THE DRINK AND DROWN.INCLUDING THE VIADUCT BASIN AND PRINCES WHARF. His council was contributing to the purchase of Queens Wharf, but he would not say how much it was giving. Ports of Auckland chief executive Jens Madsen said the company was a willing seller and alternative arrangements for customers now using the wharf would be made. * $190m to upgrade Eden Park. * $20m towards purchase of Queens Wharf. * $59m of committed projects. * $10m set aside for Queens Wharf. * $90m-plus extra for Queens Wharf (unbudgeted). * $10m towards Eden Park upgrade. * Queens Wharf purchase, cost unknown. MIKE LEES GIVING TEN MILLION TO HIMSELF? Building convention and exhibition facilities, a new cruise ship terminal and supporting tourism infrastructure on Bledisloe will bookend a broader, vibrant and more people-friendly waterfront.